OMG 2012 is almost over and I am almost 53 years old. The Lord has been good to me and I thank him everyday. My quilting is not where I want it to be but despite all of my sickness and financial hardships this year I have managed to work on several projects. This year I launched the Quilting DIVAS Red Hat Group and I am looking forward to the fun and fellowship of this new group in my life. I continue to trust and believe that God will bless me with employment in his time as I continue to do his will. 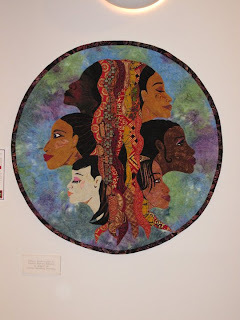 I have just discovered a FB friend Nancy Cash beautiful work and have fallen in love with her Circle quilt entitled Quilting Circle.